Are you sure you want to remove Confessions from your list? 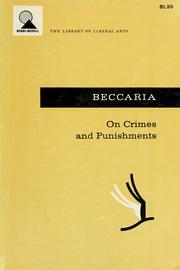 Confessions is an autobiographical book by Jean-Jacques Rousseau. It covers his life up until fifty-three years of age, so until 1765. 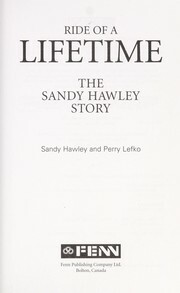 This autobiography was completed in 1769, but was actually not published until 1782. 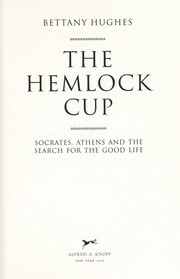 It is a unique autobiography in the fact that Rousseau wrote about even his most humiliating moments. 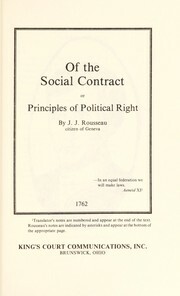 Rousseau also writes about how he "disposed" of his five children, whom he had out of marriage with Theresa Levasseur. I have resolved on an enterprise which has no precedent and which, once complete, will have no imitator. My purpose is to display to my kind a portrait in every way true to nature, and the man I shall portray will be myself. added by Janis Faith Sellers. 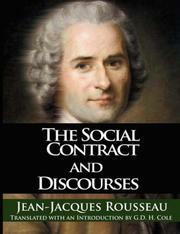 The confessions of Jean-Jacques Rousseau. : Translated and with introd. by J.M. Cohen. Confessions. : Introd. by R. Niklaus. The confessions of Jean-Jacques Rousseau: the anonymous translation into English of 1783 & 1790 revised and completed by A. S. B. Glover, with a new introduction by Mr. Glover, illustrations by William Sharp. in French - Éd. intégrale, publiée sur le texte autographe conservé à la Bibliothèque de Genève, précédée d'une introd. e suivie de notes et d'un index par Ad. van Bever. Les confessions [et] Les rêveries du promeneur solitaire. The confessions of Jean Jacques Rousseau. 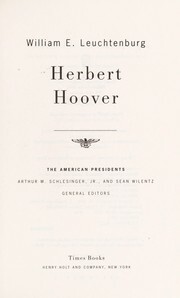 1931, J.M. Dent & sons, ltd.
1930, Farlag "Yidish", Farkoyf Gez. "Tsentral"
1901, Gibbings & company, ltd.
in English - New ed. 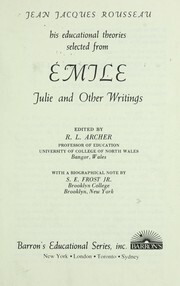 with illustrations after Maurice Leloir. Les confessions de J.J. Rousseau: vignettes par MM. T. Johannot, H. Baron, K. Girardet, E. Laville, C. Nanteuil, etc. Microform in English - Third edition. The confessions of J. J. Rousseau. : Part the second. 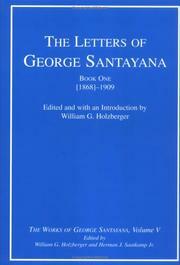 To which is added a new collection of letters from the author. The confessions of J.J. Rousseau: with The reveries of the solitary walker. Translated from the French. 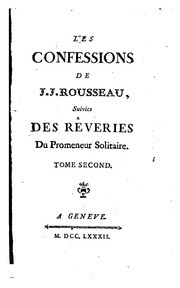 Les Confessions de Jean-Jacques Rousseau ; suivies de, Rêveries du promeneur solitaire. 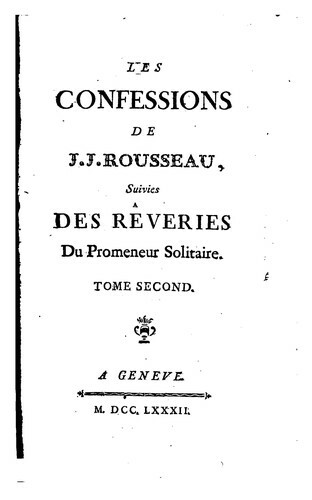 Les confessions de J.J. Rousseau: suivies des Reveries du promeneur solitaire. Les confessions de J.J. Rousseau: suivies des Rêveries du promeneur solitaire. in French - Nouv. éd., revue avec le plus grand soin d'après les meilleurs textes. Publish date unknown, Walter J. Black Co.
March 30, 2014 Edited by Janis Faith Sellers Edited without comment.